These make my mouth water. And when my mouth waters, it's an event. You see, I produce more than the average saliva. My dentist noticed it back in the day since he couldn't get to my molars for the ocean in my mouth. He kindly pointed out that the more saliva you have, the less cavities you have since that river washes the sugar away. My brain processed that as "Eat all the candy you want." I'm also the go-to for envelope licking and choking on one's own spit while listening intently to a Sunday sermon. How is it possible that I'm not married? 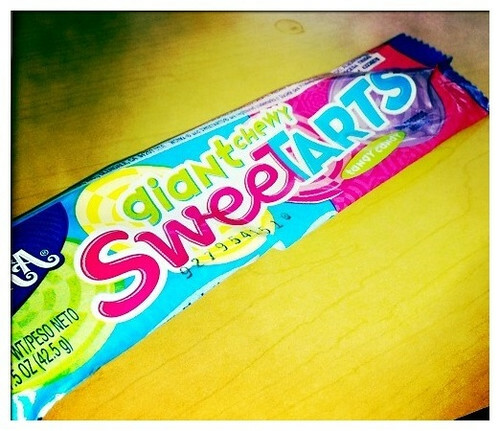 I seriously go looking for giant chewy Sweetarts at gas stations and on road trips. I used to be that way with the boardwalk plank cookies - basically just sheets of gingery, almost animal-cracker cookies with icing. KO: It does make me feel better. Thank you for confessing. MH: I try to always see the glass half full. Or pretend there's a glass and see it half full. You should live in Walker County. Spit is probably a plus when you get a few miles off 78. Let me guess ... your pillows frequently run away ... or would that be wash away? J: Maybe for cooking? Or family game night? BJP: It's weird. I only drool when I nap not when I sleep at night?!? CM: I'm glad I could tempt you.